The film opens in 1933 as John Dillinger (Johnny Depp) is brought to the Indiana State Prison by his partner John "Red" Hamilton (Jason Clarke), under the disguise of a prisoner drop. Dillinger and Hamilton overpower several guards and free members of their gang including Charles Makley (Christian Stolte) and Harry Pierpont (David Wenham). The jailbreak goes off without a hitch, until gang member Ed Shouse (Michael Vieau) beats a guard to death. A shootout ensues as the gang makes its getaway. Dillinger's friend and mentor Walter Dietrich (James Russo) is killed, and a furious Dillinger kicks Shouse out of the car. The rest of the gang retreats to a farm house hideout, where crooked Chicago cop Martin Zarkovich (John Michael Bolger) convinces them to hide out in Chicago, where they can be sheltered by the Mafia. Elsewhere, Melvin Purvis (Christian Bale) and several other FBI agents are running down Pretty Boy Floyd (Channing Tatum). 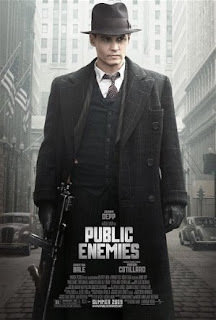 Purvis kills Floyd and is promoted by J. Edgar Hoover (Billy Crudup), who is struggling to expand his Bureau into a national police agency, to lead the hunt for John Dillinger, declaring the first national "War on Crime." As i watch the movie, i found out that the plot goes out so slow, to he point that it is boring.. At first, it is OK, with all the bang bang and bloodie things..